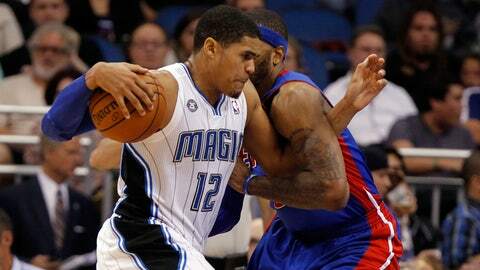 Tobias Harris and the Magic topped the Pistons in their previous meeting this season. The last time the Orlando Magic faced the Detroit Pistons, emerging centers Nikola Vucevic and Andre Drummond matched up. The Magic are currently struggling without Vucevic while Drummond turned in a poor effort his last time out heading into Tuesday night’s rematch in Detroit. Orlando (12-33) won 109-92 over Detroit on Dec. 27, behind Vucevic’s 20 points and 11 rebounds. Drummond had 10 and 11 two games before he began a run of 10 double-doubles in 11 games. The Magic have now dropped nine of 11, with Vucevic out while recovering from a Jan. 6 concussion. "(It’s) extremely tough," coach Jacque Vaughn said. "Everyone has to be involved and help us out while we don’t have Nik." Drummond averaged 12.7 points and 14.3 rebounds in his sizzling 11-game stretch before his run of seven straight double-doubles ended as he finished with four points and six rebounds in Detroit’s fourth straight loss, 116-106 at Dallas on Sunday. The second-year big man had 21 points and 20 boards two nights earlier against New Orleans. "He just had a bad game," coach Maurice Cheeks said. "The guy is 20 years old and we’re not going to expect him to be like a machine every night and go grab 18 or 19 rebounds. He’s 20 years old and he just didn’t have a good game." The absence of Vucevic was evident Sunday in Orlando’s eighth straight road loss, 100-92 to the Pelicans. The Magic were outrebounded 48-32. Orlando is using the undersized 6-foot-9 Glen Davis at center, and he has failed to reach double figures in points in three straight contests. Davis has totaled 24 points on 36.7 percent shooting in that span. 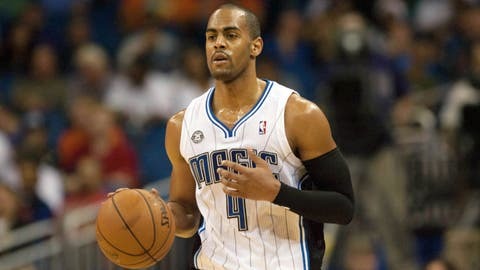 Orlando Magic analyst Jeff Turner explains why Arron Afflalo deserves a spot in the All-Star Game. "We’re asking Glen to do a lot of things and he’s doing a great job for us but we have to help him," point guard Jameer Nelson said. "We have to help him on the board, help him against those guys." Arron Afflalo scored 25 points but he had six of Orlando’s 17 turnovers that led to 30 points for New Orleans. "We have to value the ball more in terms of when we get the ball when we get stops and also getting good shots when we’re on offense," Nelson said. The Magic shot 52.9 percent in last month’s meeting and will look for a similar effort Tuesday since Detroit (17-27) is allowing opponents to shoot 47.1 percent – the Eastern Conference’s worst mark. That figure is up to 53.1 percent in this losing streak, with the Mavericks shooting 58.1. "We can get a lot better guarding the ball and that’s one thing we have to do because it puts so much pressure on our big guys," Cheeks said. Brandon Jennings is averaging 28.0 points over his last three games. He is among the NBA leaders with an average of 7.3 minutes of possession. The fact that Jennings has the ball in his hands a lot, however, is part of the reason why 52.9 percent of Detroit’s baskets come off assists for one of the NBA’s lowest marks. The Pistons also remain the NBA’s worst 3-point shooting team at 30.7 percent. Detroit has won 13 of the last 17 meetings at home.